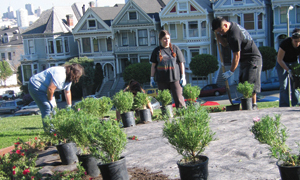 Help McLaren Park is a volunteer community organization which operates under the auspices of the San Francisco Parks Alliance. “Help McLaren Park” began working as a group of neighbors and activists trying to improve the condition of a huge local park that has been majorly neglected due to repeated budget cuts over many decades. Safety was and continues to be the number one concern for the majority of residents and visitors who used the park. Help McLaren Park believes that through increased foot traffic the park will be a safer place for all and a better place to visit for the whole community. Visit the Help McLaren Park website. Donate to Help McLaren Park.